Welcome to FWIW, ACRONYM’s weekly newsletter breaking down digital ad investment across the political spectrum. Each week, we look at whose digital spending is up, whose is down, and whose is non-existent. For what it’s worth, some of it might surprise you. We’re back from our week off, and before we dive into the Ad Archive, we want to take a moment to thank you all for reading, sharing and tweeting FWIW. Our pre-Thanksgiving edition caused quite the stir – check it out here if you missed it. 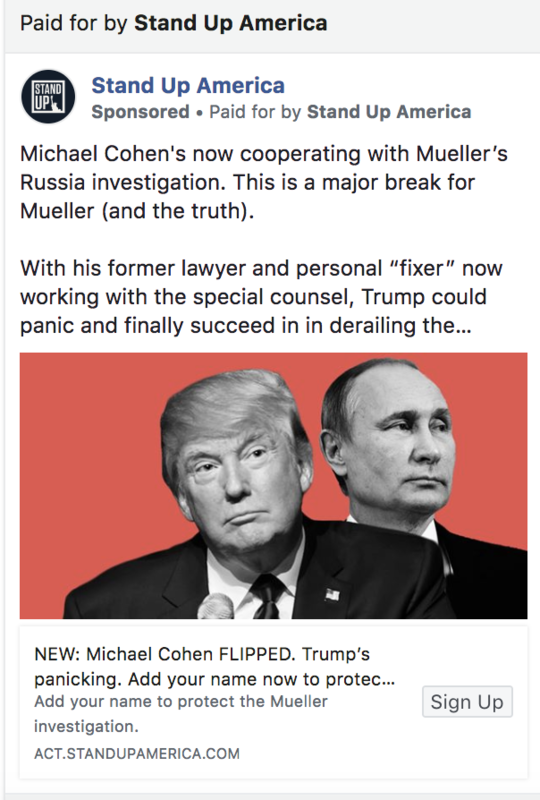 From cancelled Putin meetings to guilty pleas to “Individual 1,” it’s hard to escape the Russia news cycle. And for many organizations on both sides of the aisle, that’s not an accident. 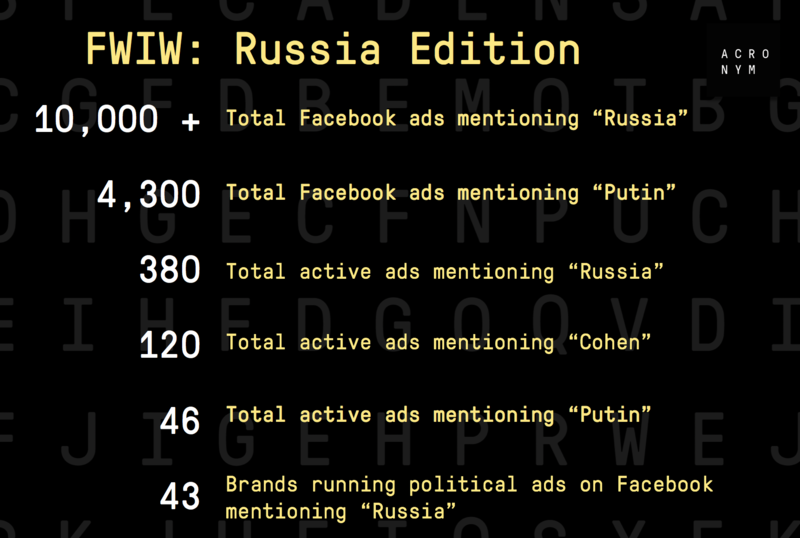 This week, we looked at how Russia might be popping up on your Facebook feed – and how the ones behind the ads aren’t from the Kremlin. 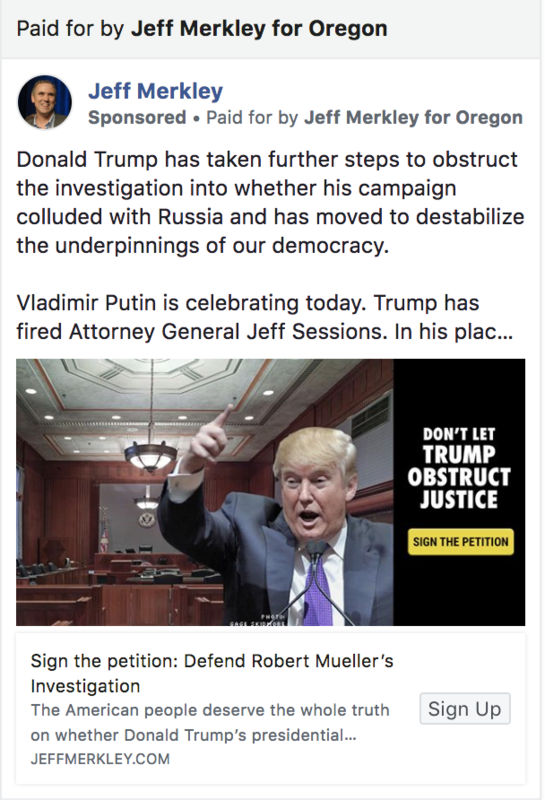 Here’s a list of the top political spenders on Facebook this week and the causes they’re advocating for. Between Michael Cohen’s plea deal and Donald Trump cancelling his meeting with Vladimir Putin at the G20, Russia news is all-encompassing these days. 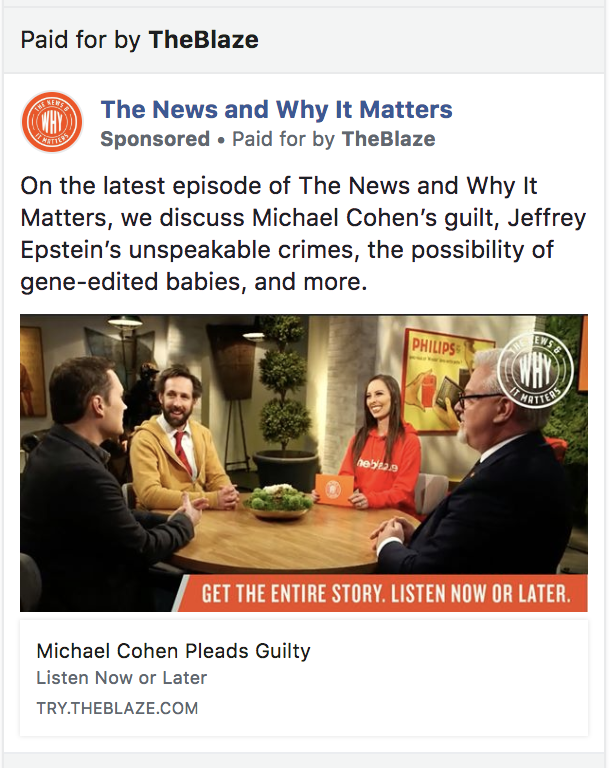 And organizations on both sides of the aisle are capitalizing on that to try to influence how their communities, supporters, and Facebook users are internalizing the news. 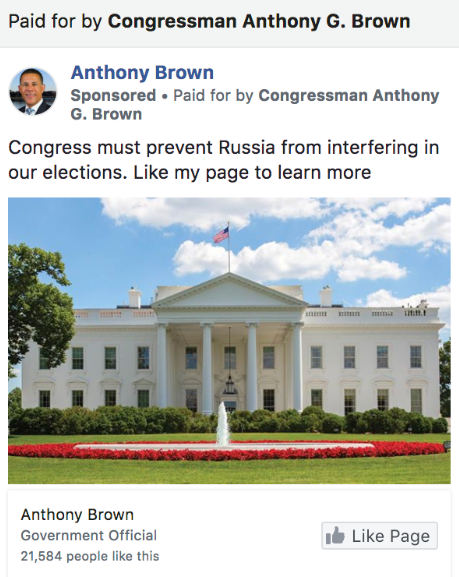 And then there’s Congressman Anthony Brown, who’s just trying to up his page likes. No shame in that. 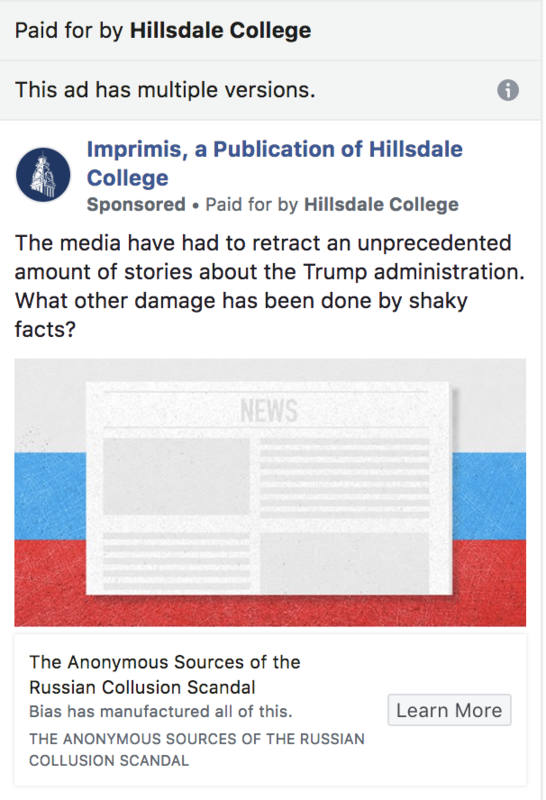 On the right, we didn’t find as many electeds or political organizations running ads around the Russia news, but we did find a number of conservative media properties using Facebook ads to promote their own content. We couldn’t find one major progressive organization or left-of-center media organization leveraging Facebook properties to get “news-style” content into Americans’ Facebook feeds. Surprised? We’re not. P.S. 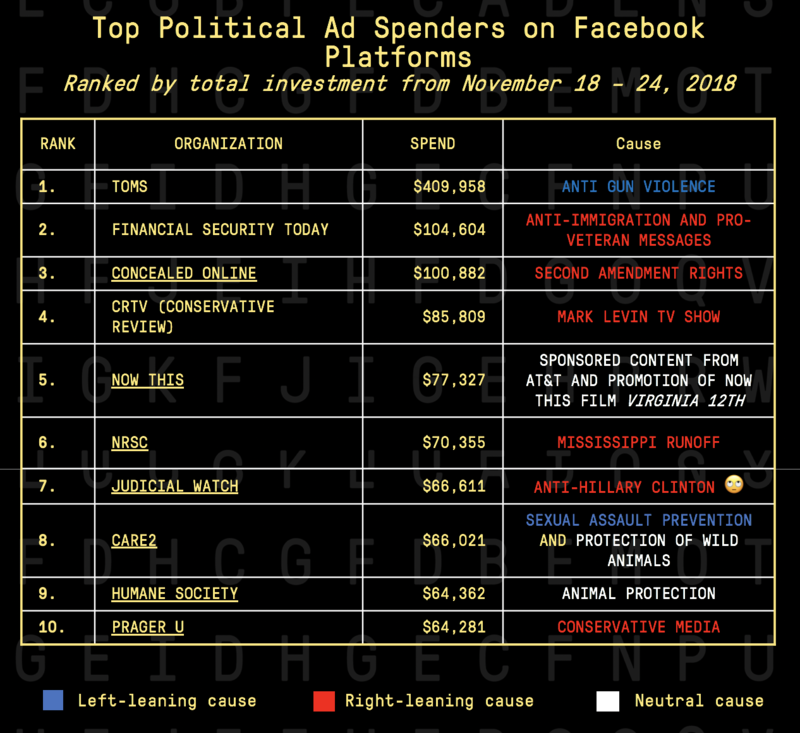 Take a look at the top spenders on Facebook platforms this week – you’ll notice that multiple conservative media properties are using the platform to get their spin into more feeds. We don’t have any data to back it up, but this could be a winning strategy . 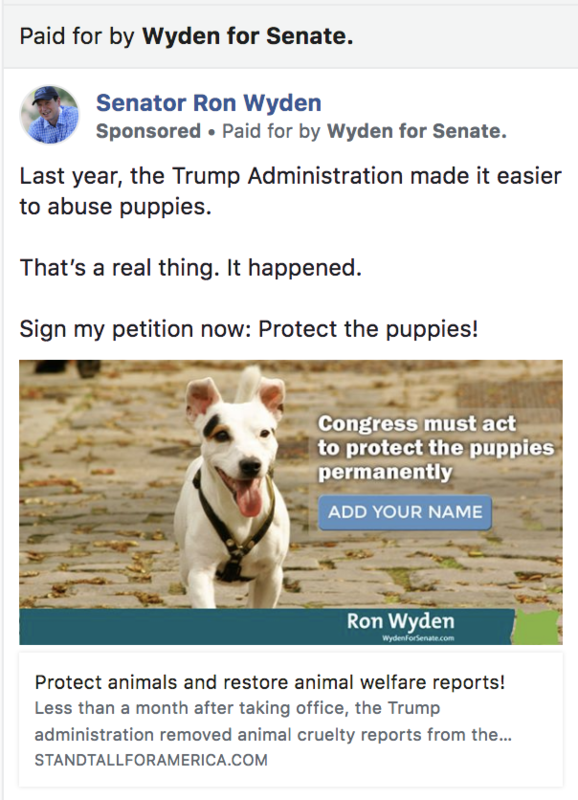 Well done, Senator Wyden. That’s all for this week. Make sure to follow us on Twitter and email us with ideas of what you’d like us to dive into next week. P.S. Here’s a sign-up link you can share with friends and colleagues. Paid For by ACRONYM. www.anotheracronym.org, not authorized by any candidate or candidate’s committee.